Weightlifting is one of the best ways to improve your fitness or get in shape for a particular sport. While some people believe this exercise does not require personal equipment, it certainly does. With a bench, power rack, and some weights you’ll almost be ready for training. But one accessory that you may need to optimize your weightlifting results is the Inov-8 Women’s Fastlift 335 Weight-Lifting Shoe. Most people ignore the essence of weightlifting shoes by deciding to work out in their running shoes. This is bad. Running shoes have been designed specifically for running while weightlifting shoes have features that make them unique for their task. So, if you don’t want to compromise your workout results, better grab the appropriate shoe. Be sure to take a look at out list of the top 10 weightlifting shoes for women and our top shoes for squats guide. Let’s have a look at how INOV-8 women’s shoe performs with regards to design, colors, breathability, comfort and the number of exercises that one can do in it. 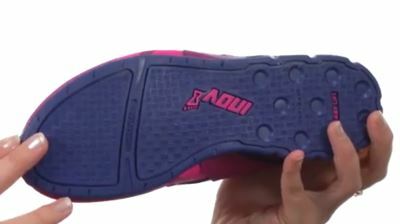 Like the men’s version, INOV-8 for women has a detailed construction that makes its quality one of the best. The sole is slightly lifted up for proper positioning that enables one do squats, deadlift and box jump effortlessly. The shoe also features a “suction cup” technology that prevents your foot from slipping. This, however, doesn’t hamper you from running. Women love color, and this shoe has been designed in a color that is adored by all women across the globe: pink. There are also blue streaks running all around the shoe giving it cool aesthetics. So far, this is the only color that INOV-8 is available in. The Inov-8 Fastlift 335’s incredible ventilation is one of the most appreciated features of this shoe. Your feet won’t heat up or create a yucky feeling while powerlifting. 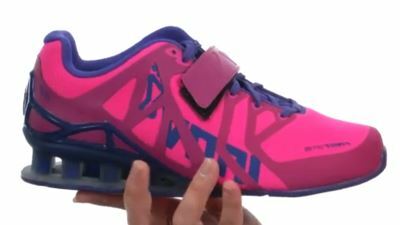 This quality has placed this shoe a notch higher than other weightlifting shoes. This shoe has an exceptional grip thanks to the laces and velcro strap for securing it. The tongue and the collar are heavily padded to provide a soothing feeling. There is also the extra outer sole. This sole absorbs much of the force resulting from weightlifting thus relieving your heel from unnecessary pain. The sole also improves squats by keeping the heel well positioned. At 335g, Inov-8 Women’s Fastlift 335 Weight-Lifting Shoe is much lighter enabling many women to complete their powerlifting successfully with no discomforts. The color is stunning, and its general design is a blend of protection and functionality. The best women weightlifting shoes are supposed to feature the following; a non-compressible sole, a raised heel, a metatarsal strap and of course an indisputable build quality. INOV-8 for women spots all these features making it one of the best powerlifting companions to help any woman lift weights to her full potential.